True, this movie did come out in 2004 but then ScooterSwag wasn’t even around then! Motorsport Scooters in San Diego has it on sale for $19.95 and they apparently there are only a few left. They measure 24″ wide and 34″ high and was a promotional poster that was only available to Vespa dealers. They come rolled and may have a few small creases. 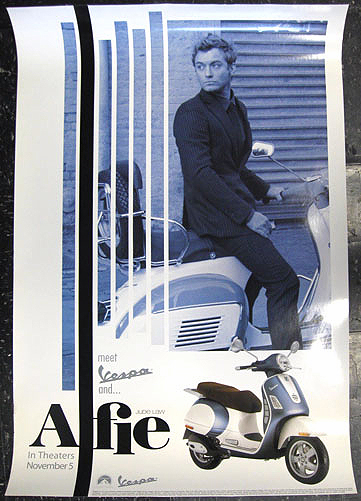 This entry was posted in Advertising, Art, Decor and tagged Advertising, alfie, jude law, scooter, vespa by Tracy. Bookmark the permalink.